When was the last time your company’s business billing program had zero initiatives? For most, the answer is never. Due to the ever-fluctuating products, pricing, customers, processes, etc., billing programs – and their respective systems – are always evolving. This is a must to support customer growth, product innovation, and operational excellence. 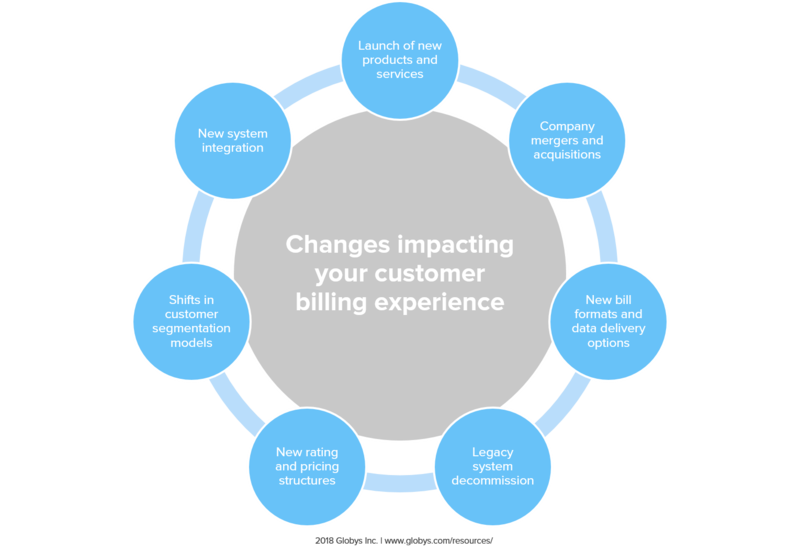 But on the flip side, how does this endless cycle of change impact the customer billing experience? Well, for some, not much at all. For others, the impacts are significant – a rise in billing inquiries, late payments, dissatisfied customers, and ultimately, churn. So what’s the variance between the two? The digital experience (or lack thereof). The digital channel offers a unique opportunity to combat traditional challenges associated with billing changes. The idea is fairly simple: provide your business customers with a single portal to access all bills and associated data across all accounts and products. What this means for your customers is they have a consistent view of their bills and usage data, regardless if you add new products or source the data from a different system. What this means for your company is your customers have no direct exposure to your in flux billing systems. 1. Billing System Replacement: A complete system re-haul typically comes with a new customer experience, either via a paper bill and/or a digital bill. While efforts are made to align the new with the old, we have yet to see an identical structuring and display of billing data in this scenario. Ironically, most companies go into a replacement with the mentality of eliminating the ‘bad’ from the legacy system. But that is often overruled for the ‘ease’ of mimicking what’s already in place. As old replaces the new, customers must learn the variances and how they impact their established validation and payment processes. These long-term projects are also a common culprit of ‘putting the digital experience on hold’ until the new system is in place. 2. Billing System Addition: Many companies have multiple billing systems in place – and are continuing to add due to acquisition activities or product-specific requirements. Given the focus on digital, many billing vendors now include a ‘complementary’ portal experience as part of the system they provide. Here’s the problem – those ‘complementary’ experiences are system specific. Meaning if customers do business with you across multiple product lines, they have to log in to multiple portals to access their bills, reports, and payments. 3. Billing System Alteration: Some billing systems have been in place for 20 or 30 years and still have sufficient capacity and capabilities to handle today’s advanced services. But that doesn’t mean they are static. The launch of new products and bundles, revised data requirements, redefining of segments, etc. are all examples of changes that have an impact on the resulting experience. As the existing bill is altered, customers have a heightened need to validate charges and pricing. If offline validation (using a paper or static PDF bill) is the only option, this can be a time intensive and frustrating process for the customer. Change is never easy – especially when it involves thousands of customers and billions in revenues. But using the digital channel as your ‘constant’ billing experience provides your business customers with consistency that is welcomed and trusted. So whether you’re taking on a full billing system replacement, supplementing your existing infrastructure, or altering your systems in place, educate yourself on the value an overarching digital experience can deliver – both in the short and long-term.